As you read this my wife is speeding to the nearest McDonald's in celebration of the unearthing of an all-important snacking factoid—there are four official, McDonald's-approved shapes for Chicken McNuggets. This changes everything. Business Insider recently had the opportunity to step inside the hallowed halls of McDonald's headquarters in Oak Brook, Illinois, where they sat in on a quality assurance meeting attended by chicken experts flown in from all over the snackosphere. That's where Barbara J. Booth, director of sensory science at McDonald's USA, dropped a bomb. McDonald's has a director of sensory science. You can be a sensory scientist. Why am I not a sensory scientist? Screw it, I am now a sensory scientist, and you can't tell me any different. Also, Chicken McNuggets must match one of four approved shapes as closely as possible to meet McDonald's "Gold Standard" for quality. It all makes sense now—Bell, Bone, Ball and Boot. As Business Insider points out, McDonald's Canada calls the "Bone" shape "Bow-Tie", but either way it's still the four B's of McNugget royalty. 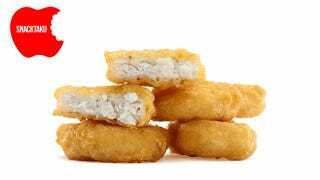 Of course McDonald's also monitors McNuggets for taste, consistency, breading thickness and other non-shape-centric factors, but I am pretty sure the shape is the most important. Where is that damnable woman with my McNuggets? No longer shall I sedately sit and eat without considering the form of the fowl I consume. From here on out I shall judge my McNuggets by the contour of their skin, and not the content of their carapace. Dammit, these are all Ball-shaped. I feel cheated.